Back in 2013 my wife and I had the adventure of a lifetime as we hiked over 80 miles round trip to Mount Everest Basecamp. I remember those long days of following our guides up steep exhausting mountain sides followed by quick descents. All the while wondering whether we’d get to basecamp or not. Sometimes, we couldn’t even see Everest in font of us as we walked on through the cold, headaches pounding due to the elevation. But at about day three we finally saw it: Mt. Everest looming in the distance. It seemed so far away, but yes, we were getting closer. Sometimes running a private practice can feel a lot like hiking high elevations. There’s ups and there’s downs but all along you trust that you’re moving forward. I bet you’ve got some big goals for your practice. Maybe even scary audacious ones! And the only way to get there is to take stock of where you are now so you can get to work, one step at a time. 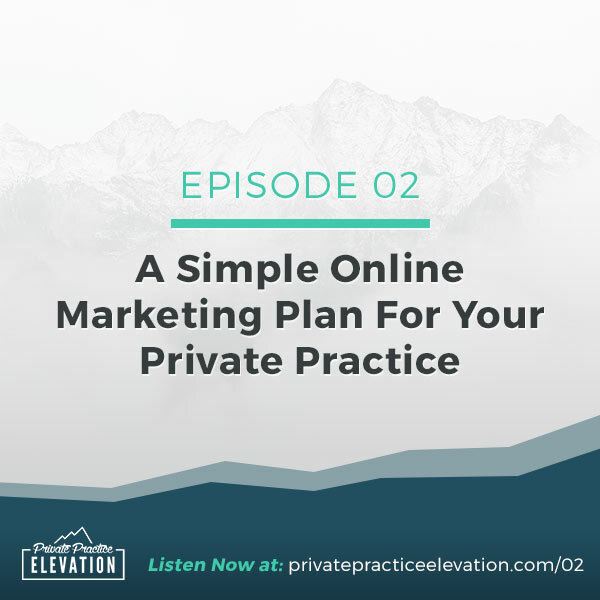 In this episode I’m going to lay out a plan, a trail map if you will, that will help understand what marketing tasks you should focus on, no matter what stage your private practice is in. This episode is brought to you by my Online Marketing Trail Map. If you’re feeling like you have no plan for your online marketing, I encourage you to download this free PDF guide and have it in front of you as you listen along with this episode. The episode really unpacks every stage of the marketing plan. Click here to access the free marketing guide.